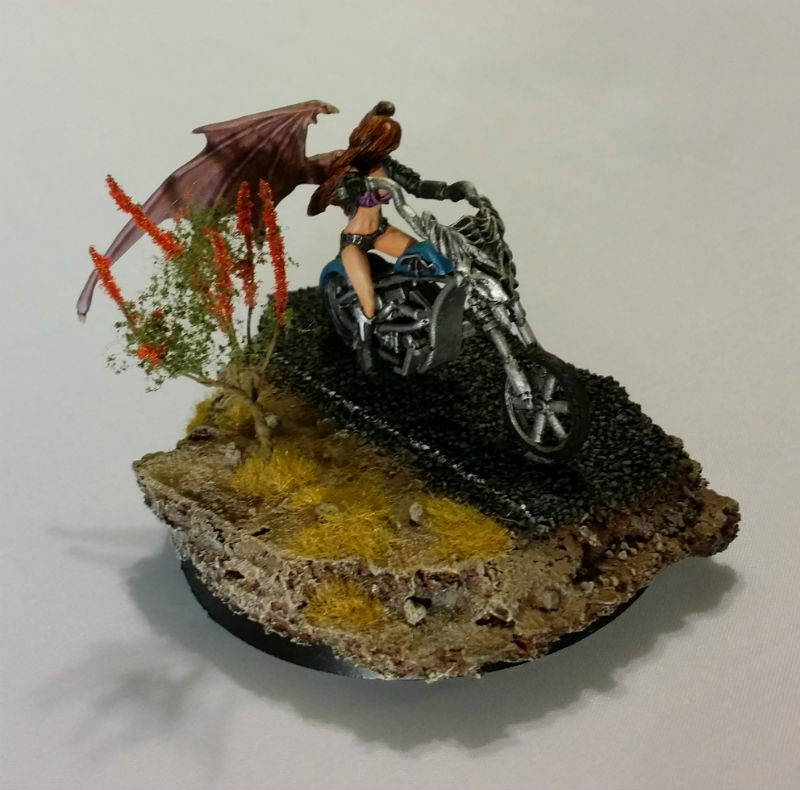 If you haven’t heard about it, check out the Creature Caster Kickstarter as well as the new G&G Ichiban Studio brushes Kickstarter. I’d love to pledge the Creature Caster Kickstarter myself, but I’m not sure I can justify the money right now. I did back the G&G Kickstarter! Also, CMON has another Kickstarter – Dogs of War, and Hangar 18 just started their Pin Ups Kickstarter, which I am probably backing! Well I haven’t painted as much as usual over the last day or two, mostly because of Christmas preparations, but also because my husband and I went to see the new Hobbit movie. It was…not the Hobbit. Entertaining, yes, but just not the same story. Anyways, I did get some more work done on Sophie. 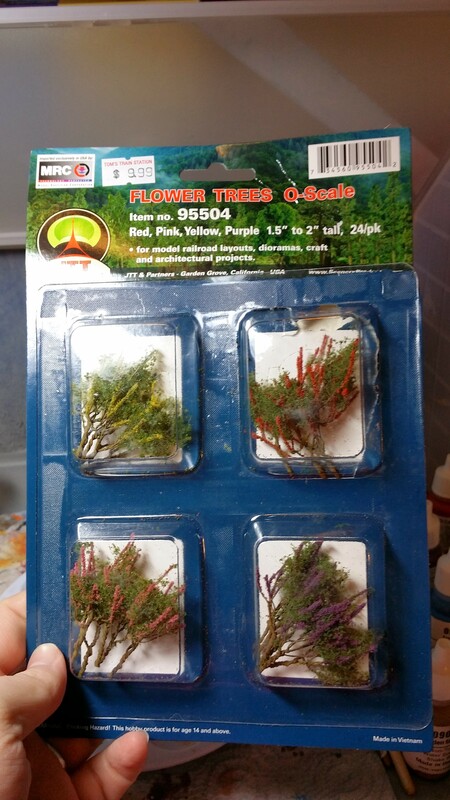 I picked up some flowering bushes/trees at the local train store. I had never seen that brand before, but they seemed to have a lot of good stuff. 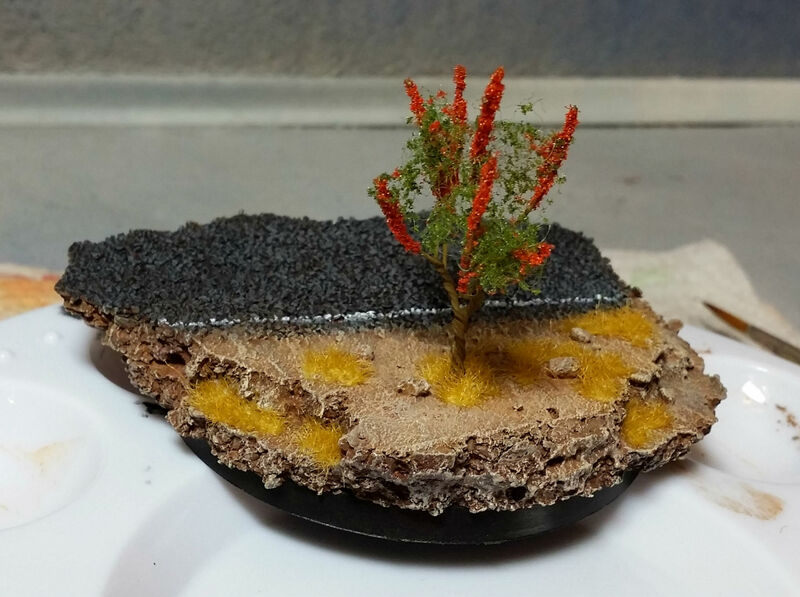 I put one of the red trees on the base with a bit of super glue. 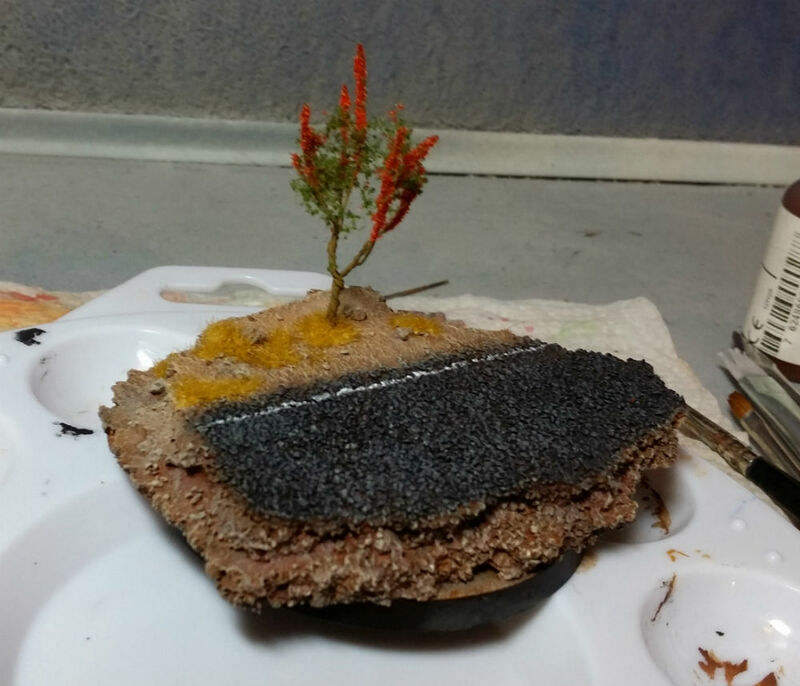 Next, I drybrushed the base again, painted black around the edge, and put Woodland Scenics Harvest Gold flock on it. After that it was time to put Sophie together. 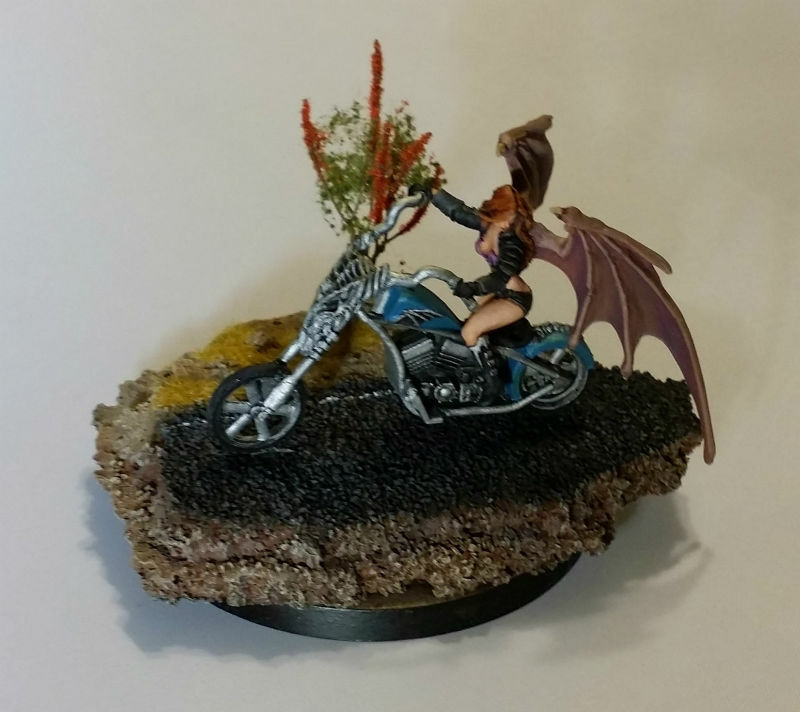 This was actually a little fiddley because she can so easily scrape against the bike in the process, and that will scrape paint off. Next, Sophie was pinned to the base. Not the best pictures…I ended up shining one of my photo lights straight at her instead of getting the whole set-up going because I was in a hurry. I will put up better pictures of her soon! 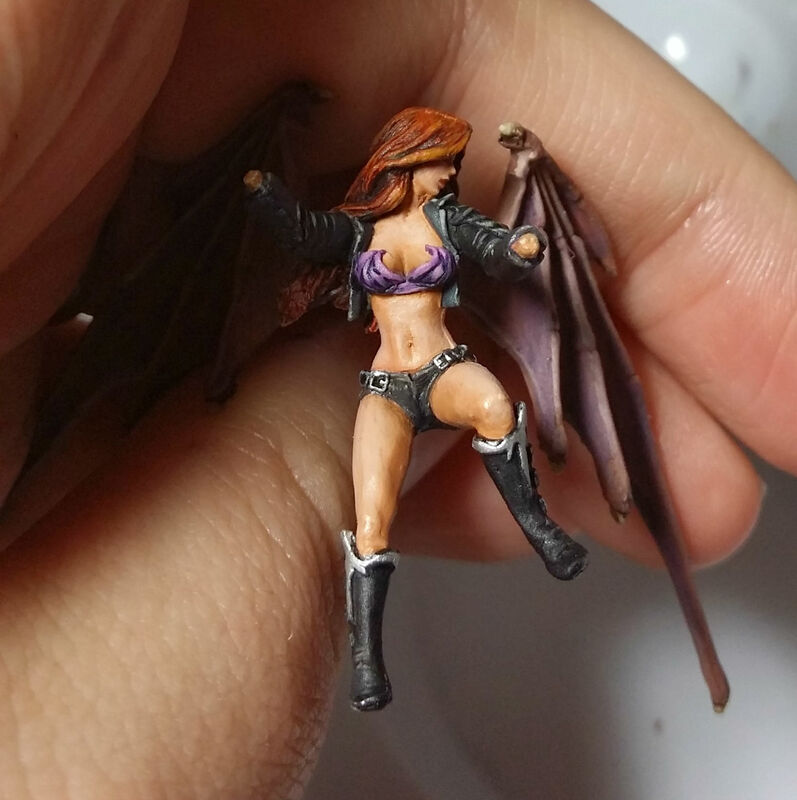 I finally got to the last tiny details of Sophie, which I painted with VMA Aluminum, which is really a very nice color for a metallic. 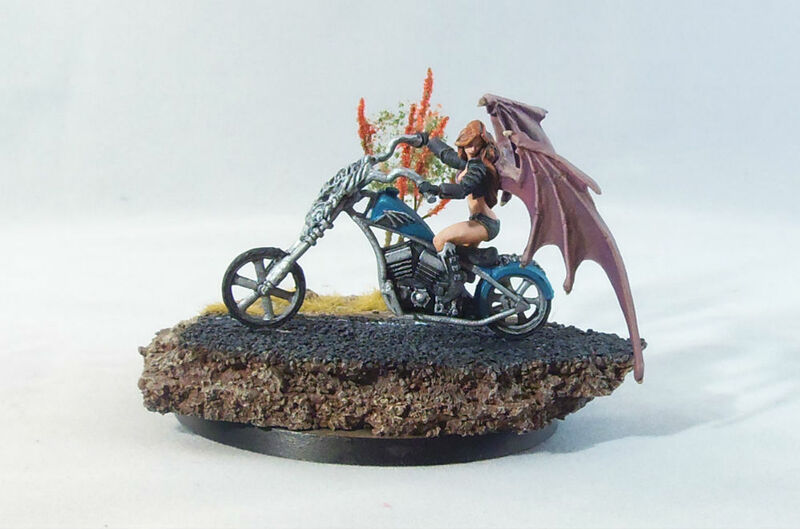 I also used a black paint wash on the bike, then I drybrushed it with VMA Aluminum. 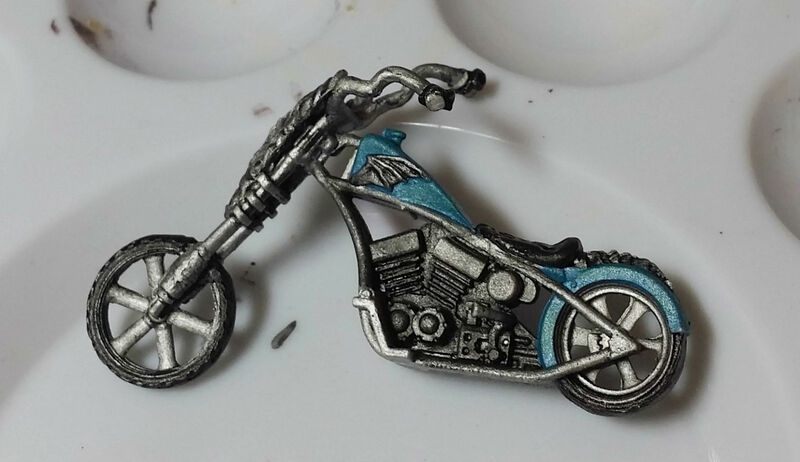 Afterwards, I painted some of the areas on the bike a blue/green metallic and touched up some of the black areas that either had Aluminum on them or just weren’t fully coated yet. 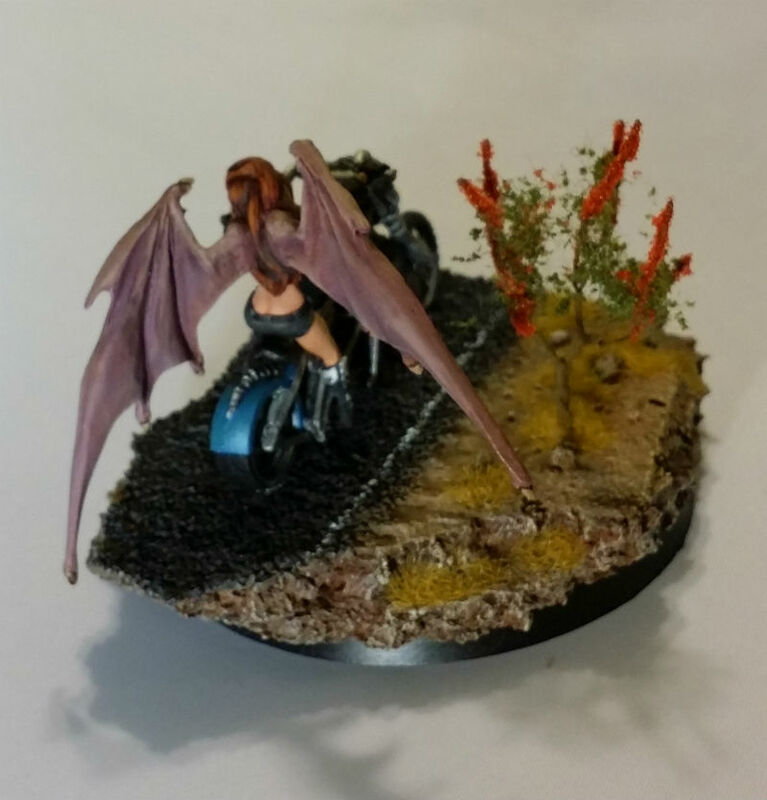 I also got some work done on Sophie’s base. First I tore up two pieces of cork, then I glued them to a 60mm round base. After that dried, I used Vallejo Red Oxide Paste to fill in some of the cracks between the pieces of cork. I put a thick layer on the top, and smoothed out the area that was going to be the road. I poured Woodland Scenics Medium Ballast on the smooth area and smashed it down pretty well to make the road as flat as possible. 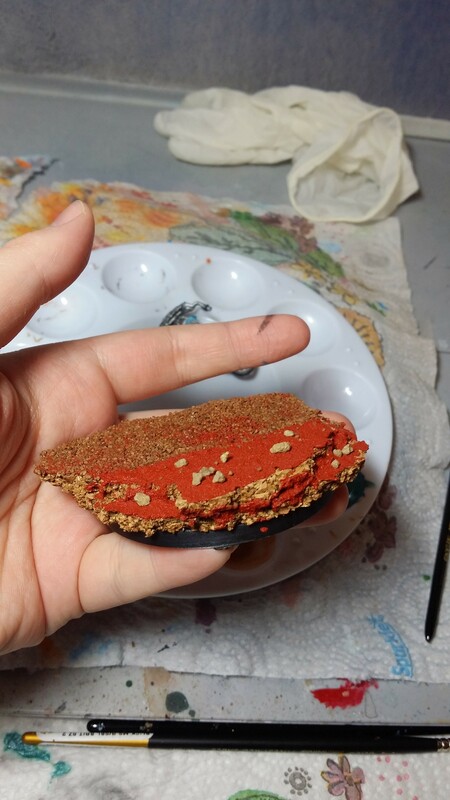 Then I put a few large rocks around the base and let it dry. Tomorrow I will paint the base and add a green stuff cactus and snake! I can’t wait to paint that thing! Too bad it’ll be a year before it arrives! On another note, the Ogre army I was painting Maneaters and the Giant Spined Chaos Beast for was at Grail Quest this weekend. 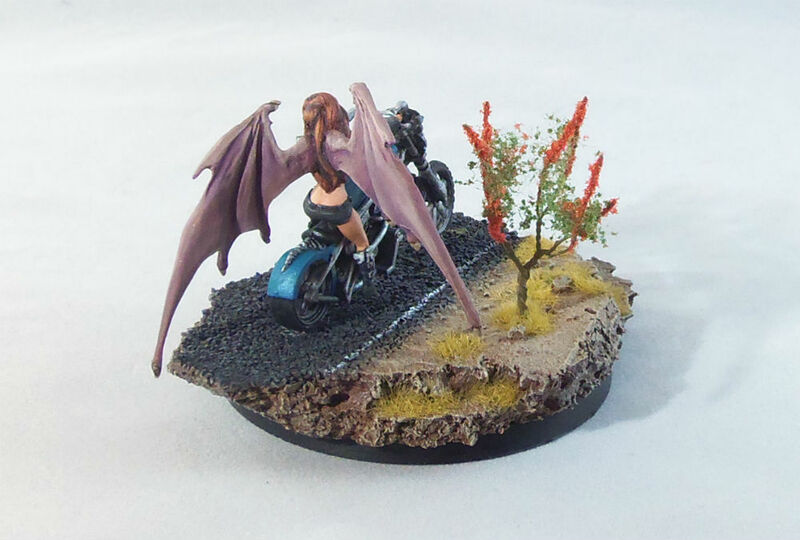 Tomorrow I should be able to put up final pictures of the models I painted. 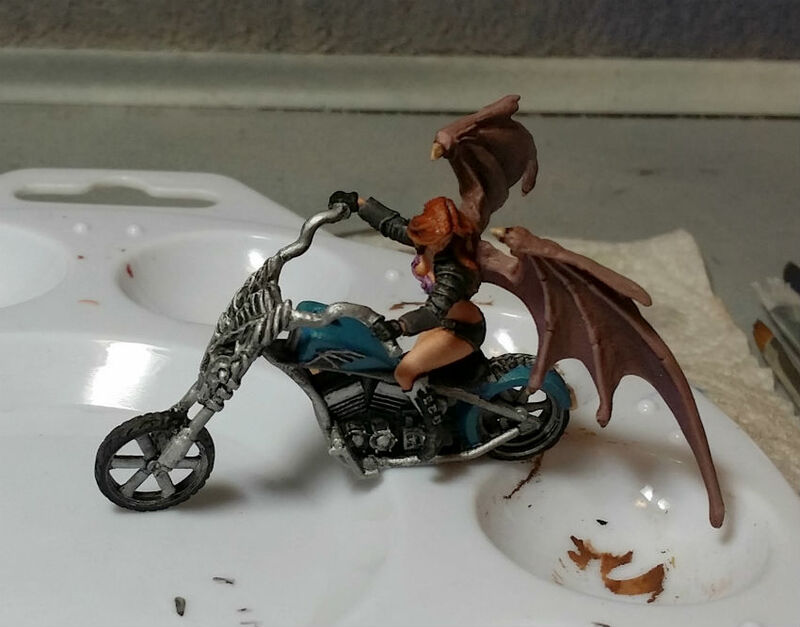 Next I’m painting a Reaper mini to be used in a D&D game and a Convergence of Cyriss Mitigator for Project Orange Crush: Hunger, so expect WIP pictures soon! Well I upped my pledge with the Reaper Kickstarter. I really like one of the big expansion sets and a few of the core models I’d like more than one. Also, the Narthrax dragon looks pretty awesome! 26 hours to go…check it out here! So I’ve been watching the new Reaper Bones Kickstarter. I’m definitely backing it, but I’m a little concerned that the value for pledges isn’t as high as it was with the first kickstarter, and to be honest it could have been higher back then as well. Right now your can buy all of the minis from the first kickstarter at kickstarter prices if you’re willing to shop around and try a few $0.99 auctions on eBay waiting for one to go a bit cheaper than usual. Doing it that way also means you didn’t have to buy a ton of minis you might not have otherwise, thus saving a significant amount of money. I’m worried that the same will be true of the miniatures from this second kickstarter by this time next year. I also feel like they aren’t adding enough to the value of the core set, and now the stretch goals are also really far apart. I have no doubt this kickstarter will be close to as big as the first one, so unlocking the current goals isn’t something I’m concerned about. What concerns me about the greater distance between stretch goals is that there just won’t be as many stretch goals overall. Back to the value of the core set – adding basees just doesn’t cut it for me. 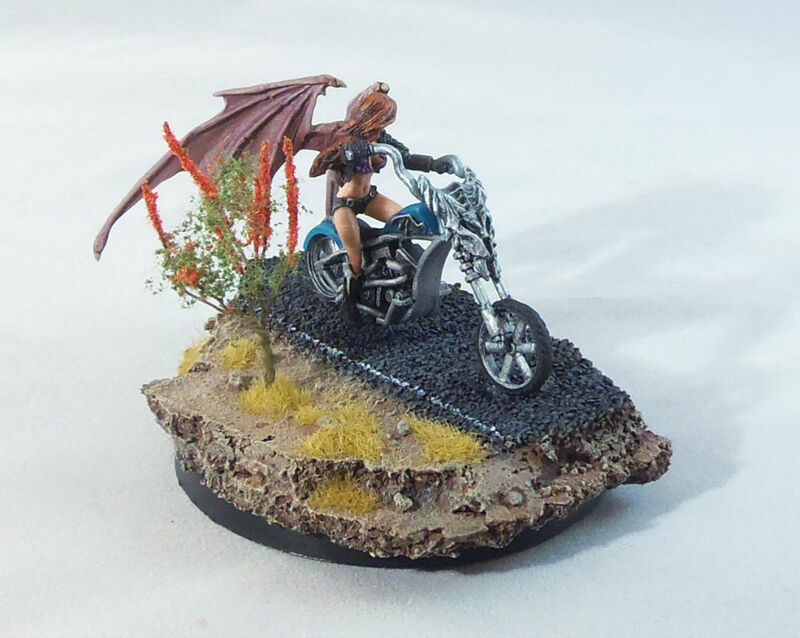 Those models should come with bases in the first place in my opinion (pet peeve of mine about Reaper in the first place). 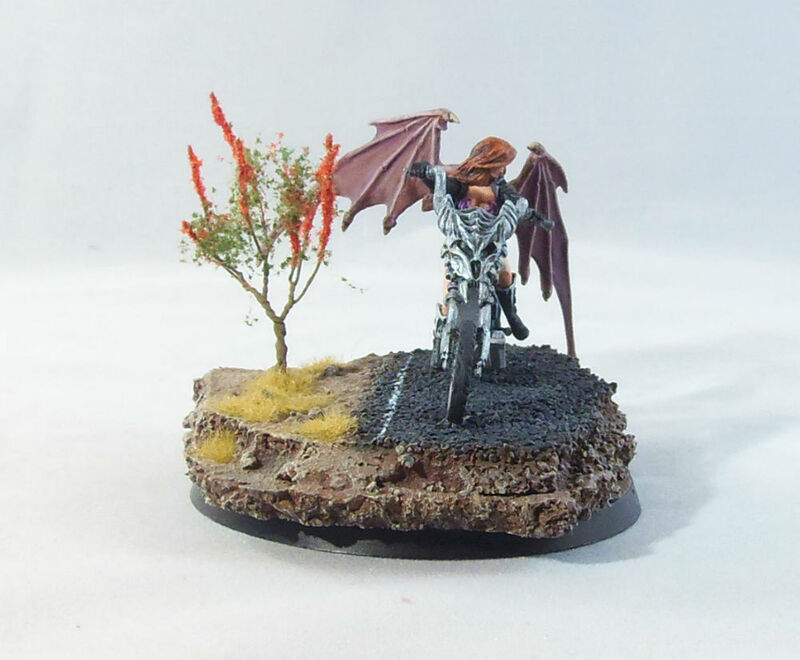 Also, many of them are cast onto bases already (another pet peeve), which are pretty terrible but still serve well enough for a lot of people, so I bet I’m not alone in thinking that adding bases to the core set as a stretch goal is pretty lame. I really want to go for some of those addons also, but a gelatinous cube and a skinny, ugly dragon, and paints that won’t arrive for a long time don’t really do it for me. I guess I’ll have to decide what I think of the value of the large expansion sets. Check it out! 3 days left in the Mierce Kickstarter…those minis and the concept art are all amazing.